Complete your home with the 3401 Cocktail Table. 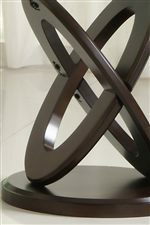 Featuring an intricate and incredibly creative crisscross base, this cocktail table lends a sense of shape, movement, and style to any home with its presence. The woodwork features a deep brown finish, while an oval glass table top adds a formal touch while also providing plentiful accent and decorating space. Pair with the matching end table and sofa table for a complete living room set. The 3401W Oval Cocktail Table with Glass Top by Homelegance at Gallery Furniture in the Oregon, Portland, Clackamas, Washington, Beaverton, Northwest, Vancouver area. Product availability may vary. Contact us for the most current availability on this product.